The Wildlife Conservation Society (WCS) is perhaps best known for its parks – The Bronx Zoo, for one – but their work protecting the world’s biodiversity is their higher mission. And, like most organizations addressing immense and complex issues, they face significant challenges in running campaigns that attack the root causes of conservations concerns and keep supporters engaged and active. We know this all too well! Since 2010, M+R has helped WCS build and manage a dynamic and ever-growing supporter engagement program, including digital advocacy and fundraising. In that period, the program has pretty much exploded, both in the sheer number of supporters and activists and the letters and comments they generate. The results are due to typical but hard-to-achieve campaigning: timely, well-crafted and compelling advocacy opportunities; constant testing and experimentation on all aspects from email format to images to social media integration; meticulous attention to every step of the user-flow, including each character in the Facebook and Twitter share content, image shares embedded into autoresponders and tell-a-friend messages…and so on and so forth. And then came the elephants. In March 2013, WCS released a shocking new study documenting a horrifying tidal wave of elephant poaching that, if it continued at current rates, would mean extinction for Africa’s forest elephants within ten short years. Of course, it provoked outrage and action on behalf of WCS’s constituents and generated hundreds of thousands comments to world leaders gathered to debate wildlife trade regulations (in addition to breaking fundraising records). Unfortunately, comments and dollars simply aren’t enough to secure a future for elephants. WCS knew it would take a sustained, thoughtful, and audacious campaign – and they asked us to help. The challenge: craft and run a campaign to keep supporters engaged for years in a problem with complicated causes and even more complicated solutions. Our intensive, ground-up planning process culminated in the launch of 96 Elephants, named (by us!) for the 96 elephants who are murdered each and every day in Africa. Yes, it’s that bad. The campaign launch aligned perfectly with a commitment by the Obama administration to address the poaching crisis as well as the rollout of a multiparty and multinational commitment to saving elephants at the Clinton Global Initiative. Given the swell of attention, it’s not surprising that the campaign was a success from the moment it launched and has only picked up steam with each passing month. Momentum for a federal ban on ivory sales continues to grow; state-wide ivory bans are passing; U.S. government funding to protect elephants and track down poachers and illegal ivory is expanding; and PBS’ Antiques Roadshow has removed ivory tusk appraisals. The list is impressive and continues to grow. 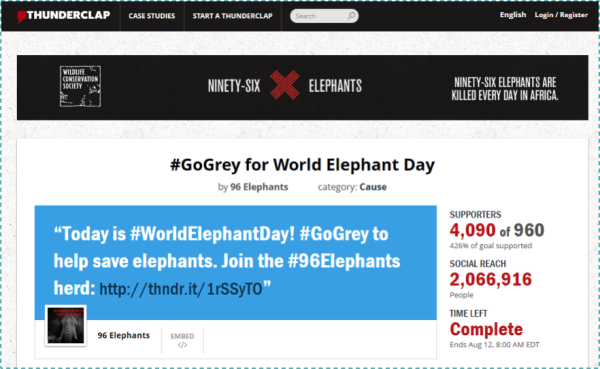 And this: nearly half a million people have taken a 96 Elephants action – 100,000 of whom were new to WCS’ online program. More than 196 partners have signed on in support. Celebrities from Neil Patrick Harris to Billy Joel have taken up the cause, penning op-ed pieces, tweeting links and recording videos. Media entities have donated ad space, reporters have devoted inch after inch of ink to the story. With all of this, you’d think the road ahead was easy. Nope, not in the slightest. In fact, we’ve entered the hard slog of campaigning, after the “easy” victories have been achieved. Now, the campaign is about sustaining interest in what can appear to advocates to be minute details or repeated asks (Why does this little tiny rule matter? Or, Didn’t I already take action on that?). This is where our creativity and discipline kick in. Every day, M+R comes up with new ways to ask the same questions and actions of our supporters in order to maintain the steady drumbeat the campaign requires. New outreach images and tag lines, inventive attention-getting stunts, clever uses of tools and technology in our advertising, Thunderclaps, targeted social media stalking of influential lawmakers – all of these and more are how we’re keeping up the pressure, day-in, day-out. Truth is, saving elephants from extinction is equally enormous and bureaucratic. Our job is as large and imposing as the animals themselves. We’re up to the task. More than 98,000 drawings, letters, and petitions were collected from supporters in 25 states and sent to governors in support of a ban on the sale of ivory. Social media efforts achieved a total potential reach of more than 3 million, with a total engagement of more than 58,000 actions. 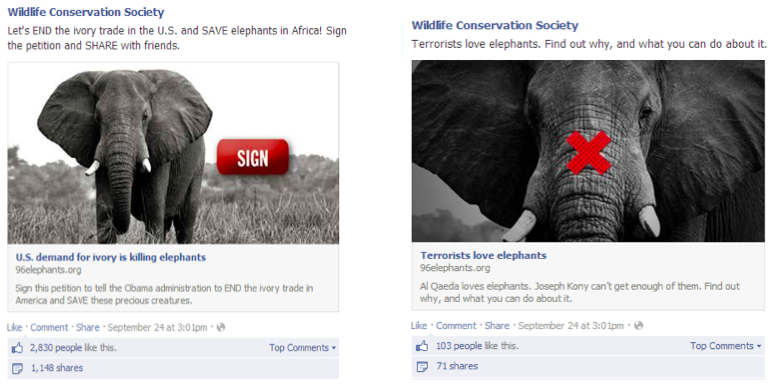 The campaign reached 575K people through posts on Facebook. The image share associated with the day and Celebrity Photo Album were the most popular pieces of content. 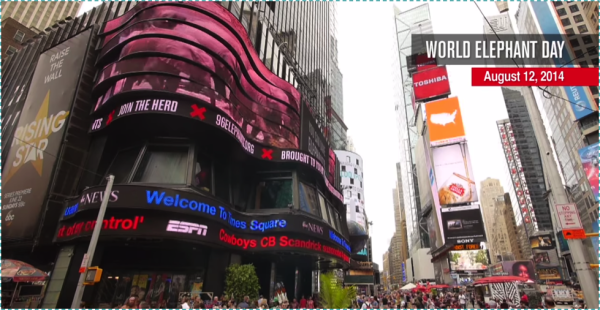 ABC’s Supersign ran a 30-second digital spot 8 times per hour throughout World Elephant Day, while another billboard owned by Clear Channel ran a spot every 30 minutes throughout August. The same digital messaging was featured at Citifield during a Mets home game. Major national news outlets like NBC News and National Geographic also covered the event. We developed and tested social media creative to spread the word and support online. The straightforward creative on the left dramatically outperformed the “curiousity” version on the right…. cost per acquisition dropped by more than 400 percent! Thunderclap helped us blanket social media by coordinating a barrage of tweets and Facebook posts among supporters, allowing us to hijack hashtags and trend during key campaign moments.